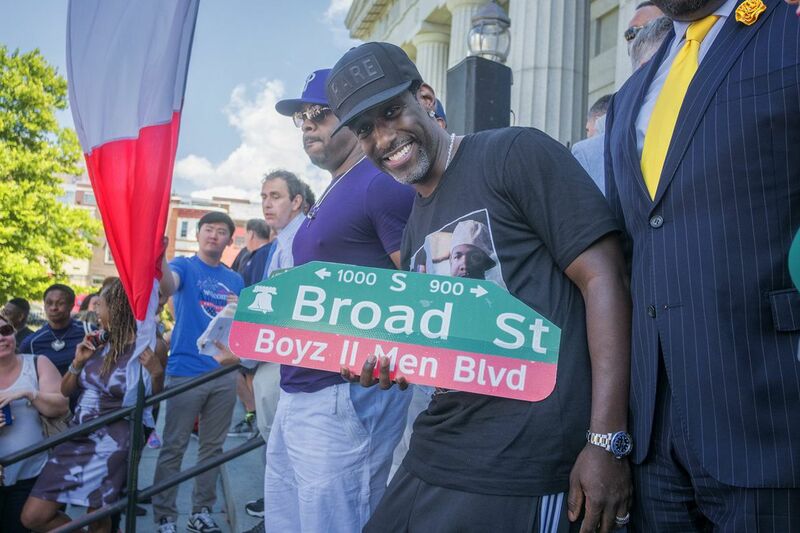 Native sons Boyz II Men were honored in a ceremony renaming Broad Street between Christian and Carpenter Streets “Boyz II Men Boulevard.” Band member Shawn Stockman shows off the new street sign. They no longer live in the city where their careers began, but R&B singers Boyz II Men returned to Philadelphia on Saturday to put up a marker to celebrate where their careers began more than 20 years ago. The trio — Nathan Morris, Wanya Morris, and Shawn Stockman — helped unveil a street sign to officially rename Broad Street, from Christian to Carpenter Streets, "Boyz II Men Boulevard." The section is near the Philadelphia High School for the Creative and Performing Arts, where the members of Boyz II Men were once aspiring young musicians with big dreams. After a drum roll by the school band, the trio and a host of city officials and dignitaries stood on the school's concrete steps to unveil replicas of the street name. Red, white, and blue confetti swirled in the air as a crowd of about 100 people cheered. Members of Boyz II Men (from left) Wanya Morris, Nate Morris and Shawn Stockton joined city officials Saturday to unveil a replica of street sign renaming Broad Street between Christian and Carpenter Streets in their honor. "This is where it all started. It's a real honor to know that the city that raised us, the city that practically brought us up musically and otherwise, was gracious and kind enough to give us this honor," Stockman said. "I'm proud. It's a cool thing." The trio beamed with pride as students performed a special a cappella rendition of the group's "Motownphilly." They joined students in "Medley America," a compilation of patriotic songs. "I just love them, their voices, their songs, and who they are as people" said Dominque Silas, 25, an alumna and health-care administrator who was wearing a Boyz II Men T-shirt. "This is so amazing. Oh my God!" When they were students at the school, the Boyz II Men group used to perform at talent shows along with a fourth member, Michael McCary, who left the group in 2003 for health reasons. Back then, the school was at 17th and Christian, enrolled about 600 students, and shared its building with a middle school. Stockman, who began singing in church, proposed the idea of starting a vocal group. "It was far-fetched to reach this point. We had no idea that these things were going to come to fruition," said Wanya Morris. "All we wanted to do was sing." LaDeva Davis, who heads the dance department at the school, recalled that the aspiring musicians would often visit her studio. She taught them a few steps, she said. "They always had good voices. I didn't know they would be this big," said Davis, who has taught at the school since it opened in 1978. "I am so abundantly proud of them." The current school building was vacant for years and Nathan Morris, who lived nearby, recalled sitting on the steps writing songs. He dreamed about one day purchasing the building and converting it to a house, he said. "I'm sorry, Nathan, the building is mine. I own it," said Joanne Beaver, the school's principal. "You can come visit anytime." Councilman Kenyatta Johnson introduced the resolution to honor the native sons and chart toppers by naming the section of Broad Street near the school, which is also known as the Avenue of the Arts. The group has earned four Grammy Awards, nine American Music Awards, and a star on the Hollywood Walk of Fame. "They deserve to have the honor on the Avenue of the Arts," Johnson told the crowd. "They put Philly on the map. When they got their record deal, it was like we all made it." Their classic songs include "End of the Road," "I'll Make Love to You," "On Bended Knee, and "A Song for Mama." With 64 million albums sold, Boyz II Men are one of the best-selling R&B groups of all time. During Saturday's event, which lasted about two hours, the trio patiently signed autographs in the hot sun, posed for photographs with fans, many wearing Boyz II Men concert shirts. "This is a blessing that we're going to remember for a very long time," said Wanya Morris, the group's second tenor. In a brief interview with the Inquirer after the event, the trio shared their views on a variety of topics. Wanya Morris said "On Bended Knee" is one of his favorite songs, mostly because of the energy it generates. Stockman's musical taste ranges from Marvin Gaye to Public Enemy. Nathan Morris said the trio may one day be featured in a biopic, but only if their story is told fairly. They said they want to inspire Philadelphia's youth to set goals and to believe they can accomplish anything. "If we can do it, ya'll sure as hell can do it," said Stockman. "At the end of the day we are just boys from Philadelphia." The street dedication was part of the kickoff for the Wawa Welcome America celebration. Boyz II Men will be honored as local history-makers for their achievements in music and philanthropy during the "Celebration of Freedom Ceremony" at Independence Hall on July 4 at 10 a.m. They will also make an appearance during the annual concert and fireworks on the Parkway at 7 p.m., featuring headliner Mary J. Blige. "It is not the end of the road. It is the beginning of a boulevard," said City Representative Sheila Hess. Boyz II Men were scheduled to perform Saturday night at the "Total Package Tour" along with New Kids on the Block and Paula Abdul at the Wells Fargo Center.